i was in a very carnivorous mood, so it was an easy choice when i decided on burgers this week for nrw. but where?! 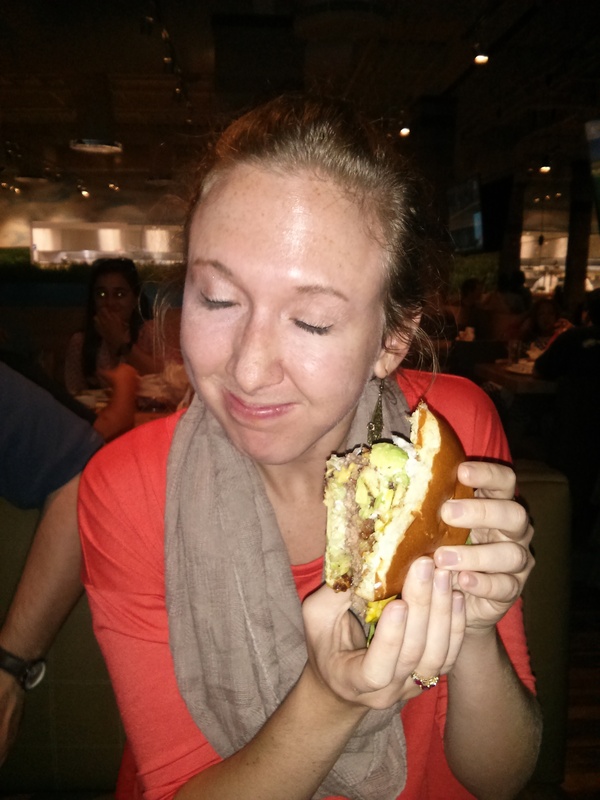 there are so many burger joints here in atlanta, which one to try next?! someone had mentioned that zinburger in lenox looked like a pretty cool spot, so i quickly announced that is where we would be dining. it was a smaller group at dinner this week, six of us total: nathan and alison, jon and turner, scootz and me. solid crew. as i arrived at the front door, it swung open, and i was cheerily greeted by an employee. “why, thank you!” the first thing i noticed and liked about zinburger was that it felt spacious and light. the woods along the wall were not too heavy, and the mirrors here and there helped make the space feel even larger. the high ceilings kept me from feeling cramped. the atmosphere was an “a.” what keeps it from being an “a+,” you ask? well, it was quite loud in there; i felt like i was nearly shouting all night and had to crane my neck to hear someone just a couple stools down. what else? we didn’t get to sit outside. the patio is quite small, and i’m jealous of the folks who got to sit out there on an unusually breezy and cool july night. although we were dining a bit earlier that night, we were all still ready to get our orders in and our stomachs filled. drinks are always a must though, and this time we kind of mixed things up. jon stuck with a magic hat beer, and i decided i needed a glass of the canyon road chardonnay. it’d been a long afternoon. but nathan and alison? they went all in at first and started with dessert! their milkshakes arrived, and all i could think was “that is a lot of milkshake. that is a lot of dairy.” i’m not joking! check these things out! nathan thought his bananas foster milkshake was divine. i mean, that caramel drizzle is enough to do you in. alison had ordered the crème brulee and thought it was fine but not life-changing, as some milkshakes can be. but, that did not discourage her! they both devoured all of them! although i wasn’t really trying to be healthy, i needed something green in my diet that day. 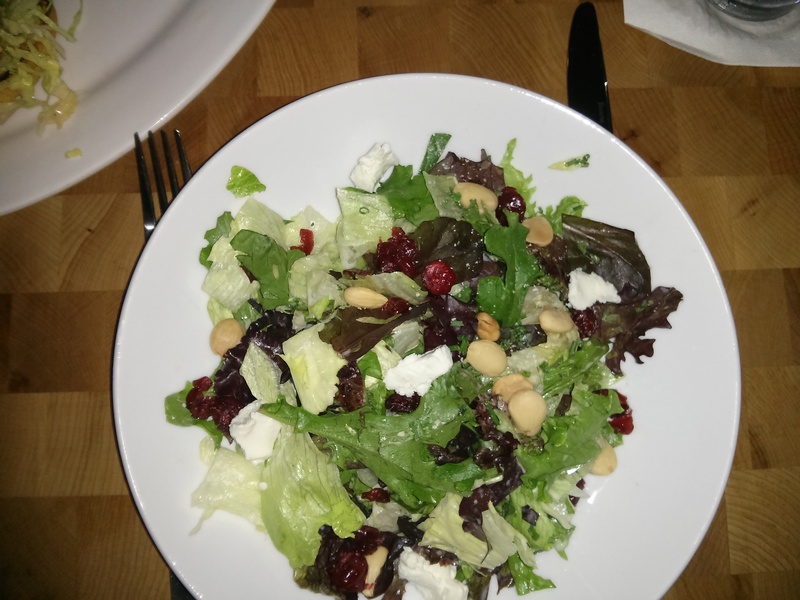 i ordered the half size of the napa, because who doesn’t love dried fruit, almonds, and goat cheese on a bed of organic greens? that’s what i thought! it was a delicious way to start the meal. soon enough the burgers made their grand entrance, and we wasted no time. although i wasn’t crazy about the presentation (this plate could be so much smaller! and those pickles? a bit of a waste if you ask me. ), that burger was dynamite. i ordered the samburger and finished the entire thing. that’s a big accomplishment, considering i hardly ever finish my meal! the 1000 island dressing wasn’t overpowering, the cheese was melted perfectly, and the bacon was nice and salty. i had ordered mine cooked medium, but it was a bit rarer than that. however, i didn’t mind how pink it was the middle, because it was so juicy and flavorful. well done, zinburger! across from me, turner really enjoyed the breakfast burger. the fried egg seemed to be perfectly fried, and that yolk spilled out right as she cut it in half. oh yes, there’s never enough egg yolk. and bacon, avocado, cheese, and mayo? definitely a burger to try next time. after seeing nathan and alison’s milkshakes, i just knew i would be getting one to round out my meal as well. the nice thing is that if you do not want a whole milkshake, you can share it with someone. they’ll even split the cost between you two. even better! with that, we ordered one double chocolate mint shake and the bars of zin. aren’t they just the cutest? i didn’t get to try the double chocolate mint, but scootz really liked it. he said the mini chocolate chips really were the best part. speaking of little candies, the bars of zin had kit kat pieces in it, and it was delicious. i loved that little crunch in there. i will say, though, that the milkshakes seemed a little too liquidy for me. i was expecting a thicker milkshake that i would need a spoon to eat. these milkshakes are not that way. they are easily slurpable out of a straw. for the food, i give zinburger a solid 7 out of 10. i had higher expectations for the milkshakes, but the burger is really what shined in this meal. if you’re looking for a place not quite as fancy as flip burger but a small step up from yeah! burger, zinburger is certainly worth the try. my only warning, though? beware the slow service! although our waitress was very sweet, we were there probably 45 minutes longer than we needed to be. we were checked on just fine for the most part, but it took quite a while for our checks to be delivered. these remarks about the service held true to what i had read on yelp! but, if you are not in a hurry and need to fill your belly after a long afternoon of relaxing shopping in lenox mall, let your feet lead you to zinburger for a satisfying meal.